I previously wrote about the Capistrano Unified Education Association’s (CUEA) lies about Craig Alexander and Julie Collier, but this is beyond the pale. After the union falsely claimed that Alexander previously sued the school district, Alexander sent Sally White, CUEA President, a letter informing her that he had never sued the school district. Sadly, the union does not care about the truth, as evidenced by a recent call sheet from the CUEA that again lies and says that Alexander represented Ellen Addonizio and Sue Palazzo in a lawsuit against the district. Alexander was too nice in his attempt to reason with White, but her willingness to perpetuate lies for the sake of keeping power tells me that she deserves no respect. No one should tolerate these shameful acts by the union, and I would encourage everyone in the Capistrano Valley Unified School District to vote for Alexander (Area 4), Addonizio (Area 6) and Collier (Area 7) and tell the unions that you are not putting up with their lies anymore. And to the union members, I would ask you to do the honorable thing and contact the CUEA and tell them to stop lying and start addressing the only important thing – the education of the students in the district. 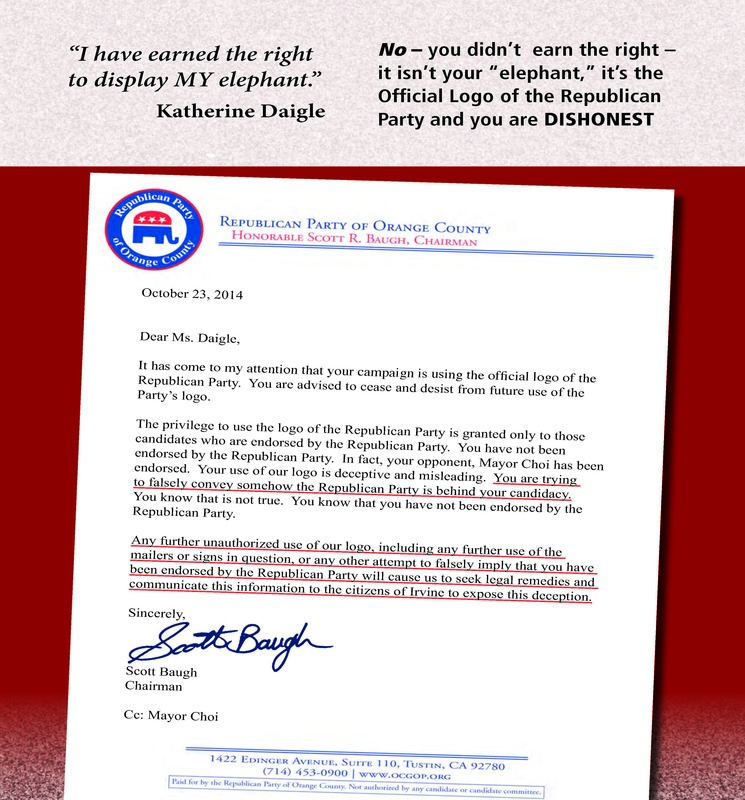 For years, candidates who did not have the Republican Party endorsement have used creative ways of implying that they’re endorsed by the party, sometimes through creative wording, other times with creative logos. This year, the Republican Party of Orange County has been more aggressive in trying to curb these inaccurate implied endorsements and has been sending cease-and-desist letters to various candidates who have attempted to imply endorsements from the Republican Party despite not actually being endorsed. 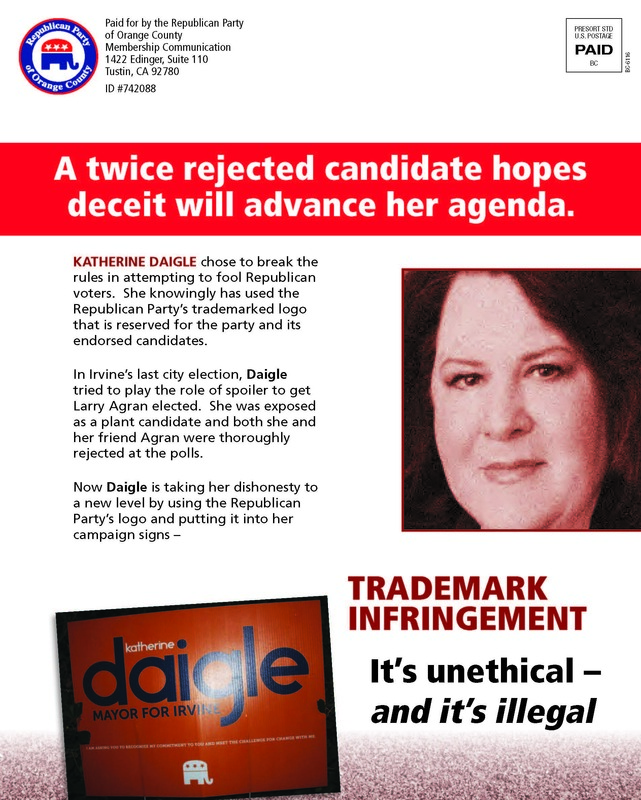 It seems Irvine Mayoral Candidate Katherine Daigle went too far this time. She has been using the official Republican Party logo for her campaign. She too received a cease-and-desist letter. Among the items mentioned in the cease-and-desist letter sent to several candidates is a threat that the party will “communicate this information to the citizens” of the area where the candidate is running. Robert Ming and Lisa Bartlett, both Republicans, emerged from the June open primary as the top-two vote getters for the Orange County Board of Supervisors race in the Fifth District. Ming (who I am supporting) and Bartlett will face off on November 4 for the privilege of representing most of south Orange County on the Board. I have known Ming for several years, and I can attest to his conservative credentials, and his character as a man. I do not know Bartlett, so I can only form an opinion based on her actions on the campaign trail, and, in my opinion, they do not reflect well on her. In June, Bartlett issued a press release called “Ming’s Dings” that was an attack on Ming and his supposed policies “dinging the taxpayer.” However, as I previously reported, the release was riddled with false facts and errors. Despite being called out on those false assertions, I have not seen any retraction from Bartlett. In addition, while that first installment of “Ming’s Dings” promised subsequent regular reports of how Ming was supposedly dinging the taxpayer, I have not seen another installment. Apparently, Bartlett could only muster that one attack on Ming’s policies, and even that attack contained false facts. On September 2, Bartlett issued a press release, again using false facts to erroneously claim that she was fundraising at a 2-1 clip against Ming. In fact, the true fundraising numbers showed a small difference between the two. I know that candidates often embellish their mailers and take liberties with the way they portray their opponents. But what should not be tolerated is outright lies, and Bartlett has twice shown that she apparently cares more about smearing Ming than getting the facts right. Equally troubling is that the public employee unions seem to be spending a lot of time and effort on Bartlett. I recently received a mailer from a local PAC in support of Bartlett that smeared Ming with the same false facts that Bartlett used in her “Ming’s Dings” hit piece. The PAC has received $18,000 from the Orange County Employees Association and the Orange County Professional Firefighters Association, both public employee unions. I reached out to Bartlett’s campaign for comment on whether her campaign had coordinated with the PAC on the mailer, or provided the PAC with the erroneous information, but she did not respond. I recently learned that another public employee union, the Association of Orange County Deputy Sheriffs has endorsed Bartlett. As a conservative, all the union money and the endorsement thrown at Bartlett concern me. Public employee salaries and benefits are a huge County expenditure, and the unfunded pension liability threatens not only the current financial stability of Orange County, but also the future for my kids. Ming has a plan to reduce the unfunded liability by benchmarking public employee salaries to those earned in the private sector. Ming also is an advocate of transparency in the labor negotiation process. Ming also wants to solicit private-sector bids for services that are not core government functions. The Register feels that Ming’s knowledge of fiscal management makes him the best-suited to the Board, and I would encourage the readers to vote for Ming in November. 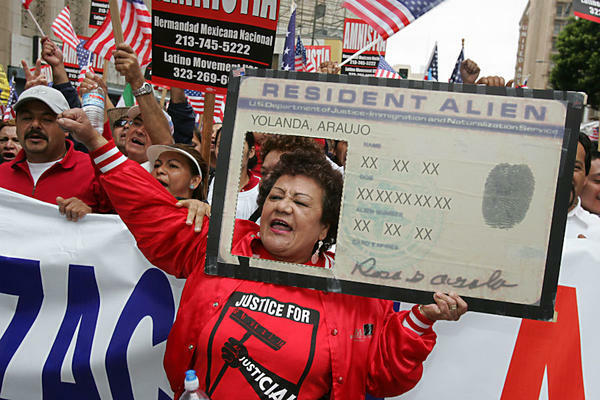 Illegal Immigration: What do Latinos Want? What do Democrats Want? Before I get into the meat of this post, I want to first dispel any notion that I am prejudiced against “brown people.” I am “brown” myself, and while growing up in the south was on the receiving end of many ethnic slurs, slights, and threats of physical harm. I lived in Monterrey, Mexico in the early 1990s for a year and a half, and have made numerous visits there, most recently to do some consulting work for the Mexican government in Mexico City. So my love and respect for the Mexican people is unquestioned and enormously deep. I only want the best for the people who embraced me as one of their own showing me great hospitality and love during my days living in Monterrey. But I cannot ignore the utter lawlessness that many American born Latino and legal Latino immigrants are promoting, who are encouraged by Democrat politicians who have supposedly sworn to uphold and defend the Constitution. At this moment, it is anticipated that president Obama will sign an executive order after the November midterm elections that would provide some sort of amnesty for possibly tens of millions of illegal immigrants, which could include work permits and green cards. This is clearly above his constitutional authority, as in the U.S. Constitution, Article 1, Section 8, it states only Congress has the authority “To establish a uniform rule of naturalization.” Yet pro-illegal immigration groups, the Mexican government, a number of Latino leaders and even Democrats in the U.S. Congress are stridently lobbying for Obama to do something about illegal immigration if Congress won’t act on their timetable. Now it is one thing for citizens to ask for a President to break the law, and another matter for a foreign government to ask for the same, but it is the height of lawlessness for members of Congress (specifically, Democrats) to encourage the president to wantonly and openly break the laws he is also charged to uphold and protect (but of course, we know, this has never stopped Obama from breaking the law so why should it now?). Now as to citizens, primarily Latino citizens, asking the president to break our immigration and naturalization laws, I have to ask what they expect to gain, and if they have thought the ramifications of this through. If Latino citizens are asking the president to openly break the law, then what is to stop the next president from openly breaking law, which may not be in their favor? Moreover, isn’t the reason most Latinos who have immigrated to the U.S. because they are from countries that have widespread corruption and tyrannical dictators? Would any of these Latinos be willing to move to Argentina, a country in economic shambles? Or Venezuela, a tyrannical socialist state where people don’t have basic needs met such as toilet paper, cooking oil, or powdered milk? Or do they wish for the grinding poverty of Honduras, Guatemala, or El Salvador? And Mexico, though better off than these countries, is one of astounding income inequality and corruption at the highest levels of government, forcing millions to flee to the U.S. for better economic opportunity and to escape drug violence. So I ask my fellow citizens calling for Obama to break the law how they can possibly believe something good is going to come of this. If Obama legalizes millions of illegal immigrants by fiat, then this will only encourage the next wave of millions looking not only for opportunity but for benefits such as healthcare, food, and schooling for their children (which includes sending children here unaccompanied which is extremely dangerous). Clearly, Obama and Democrat members of Congress are motivated to do this because they believe when (and if) these illegal immigrants become citizens, they will vote Democrat. But what will be left of America after they have played the most cynical and dishonest of political ploys? Are they expecting to create a permanent Democrat majority by unbounded growth of the Latino population? And if that is the case, what will Latinos expect in return? Certainly, they will continue to demand more resources in a country where we have weak economic growth, fifty million people on food stamps, and we can’t even take care of the veterans who have fought for our country and returned with horrific injuries that demand ongoing treatment for the rest of their lives. You can’t indefinitely import low-wage workers into an economy where so many native-born citizens are struggling to simply make ends meet. In essence, the demand that Obama break the law by American citizens of a particular ethnic group and liberal sympathizers, aided and abetted by congressional Democrats will only set America on the same path as many Latin countries that have abrogated rule of law for purely selfish and self-serving political ends. What happens in every case is that these countries who deceive their people into placing all of their faith in central government devolve into social democratic welfare states and eventually into tyrannical socialist or communist regimes because of the breakdown of the rule of law and the concentration of power into the hands of a few. I know, many don’t think it can happen in America. But don’t believe it can’t. It starts with lawlessness at the top and an uninformed public that would give up its liberties due to willful ignorance, until they eventually find out their fate is sealed and it is then too late to turn back the clock. Just ask the people of Venezuela and Argentina what happened to their republics. So I ask what is it really that Latinos want? What is it really that Democrats want? Is that the future they want? Robert Ming for 5th District Supervisor! There are a lot of reasons I have been supporting Robert Ming to be our next Supervisor from the 5th District of Orange County. Robert is a true leader that has proven himself in both the private sector and the public sector (as an eight year member of Laguna Niguel’s City Council – being its Mayor twice). The Flashreport has just published an article by Robert about the new statewide plastic bag ban. I will not re-print the entire article here, just the first paragraph with a link so the reader can go over to the Flashreport and review the entire article. In addition, Robert has taken the no union pledge meaning he will not seek endorsements or campaign contributions from public employee unions. Robert’s opponent is being carried by government employee unions as noted by my friend Greg Woodard in his recent post Union Money Invades Mission Viejo. Robert will not be beholden to any public employee union for his election to the Board of Supervisors when he sits across the table with them for contract negotiations. Disclosure: I am a long supporter of Robert Ming and his campaign for County Supervisor, 5th District. I am also a candidate for Capistrano Unified School District, Trustee Area 4 (Craig for CUSD). In addition, I am not a political consultant or on any candidate’s payroll. We’re live from OC GOP Central Committee for the final round of endorsements to decide on the recommendations of the Endorsements Committee, which we covered here. Please recall that the OC GOP Central Committee already made official early endorsements in August and regular endorsements in September. Tonight are late endorsements. With the Legislature out of session, several legislators are present, including Diane Harkey and Don Wagner. Despite this, it’s a thin crowd tonight with few controversial items and campaigns underway. In addition to Harkey and Wagner, other elected officials present are Gene Hernandez, Craig Young, Diane Harkey, Don Wagner, Fred Whitaker, Jeff Lalloway, Mark McCurdy, Sandra Crandall, David Bass, Robert Ming, Mike Munzing, Tony Beall, Todd Spitzer, Greg Sebourn, and Scott Voigts. The Central Committee hears from Youth Associates Mason Sayer and Laura Hall about the children’s book they helped put together, Sophie Votes Republican. Chairman Scott Baugh speaks about the US House of Representatives, including key seats in California. He also speaks about the US Senate. Baugh speaks about Janet Nguyen’s Senate race and Young Kim’s Assembly race. He briefly mentions local races and there is guffawing when Baugh speaks about David Shawver being “a bad boy” in Stanton. Assemblywoman Diane Harkey expresses her confidence in Supervisor Janet Nguyen’s victory in her Senate race and makes a plea to defend Senator Andy Vidak’s seat. Assemblyman Don Wagner speaks about Mayor Mario Guerra’s bid to defeat former Assemblyman Tony Mendoza in Ron Calderon’s Senate seat. Rebecca Friedrichs, lead plaintiff in Friedrichs v. California Teachers Association (CTA), speaks to the Central Committee. She discusses union warchests and how they’re acquired by payroll deduction of forced dues. Friedrichs discusses her experience as a teacher in a unionized school. She spoke of incompetent teachers who had tenure and union backing. She speaks of being forced to be in a union that uses her dues to fight for political causes she opposes. Friedrichs states union claims of being allowed to opt out of the union are only a 35% rebate of overtly campaign spending but is still forced as an agency fee payer to pay for politically oriented conferences, collective bargaining, etc. She notes that teachers who opt out are harassed, lose liability insurance, and can’t vote on contracts. Friedrichs says the opt out has to be filed every year under union rules. Friedrichs rejoined the CTA at one point and became a local CTA representative in an effort to change CTA from the inside. She speaks of CTA leaders forcing all local representatives to tow the line. Friedrichs speaks about the 10 plaintiffs, including herself, who filed a federal lawsuit against the CTA. She says they want to allow individual employees to opt out of their union and end forced dues. The case is now pending before the U.S. Ninth Circuit Court of Appeals. Friedrichs and her fellow plaintiffs intend to lose at the Ninth Circuit in order to appeal to the U.S. Supreme Court to overturn Abood v. Detroit Board of Education. She urges people to visit cir-usa.org to learn about the case and donate to defray the legal expenses. Central Commitee Chairman Baugh passes the floor to Endorsements Committee Chairman Mark Bucher. Bucher notes Palomares’s efforts to fight the Measure GG sales tax increase in Stanton. Jennifer Beall pulls Palomares from the endorsement list because she would like him to respond to a few questions. Scott Peotter moves and Mary Young seconds an endorsement for Bryan Palomares for Stanton City Council. Beall asks if Palomares is running with a Democrat named Keith Carr. Bucher says the Endorsements Committee vetted this. He said Democrat Carr also opposes Measure GG but Palomares is not running with him. Bucher says pro-GG Republicans are spreading mistruths about Palomares. Beall appreciates the response and supports the endorsement. PALOMARES ENDORSED UNANIMOUSLY FOR STANTON CITY COUNCIL. State Treasurer Candidate Greg Conlon speaks to the Central Committee. He speaks about California’s credit rating. He speaks about jobs. He wants to lower corporate taxes. He says he won his debate against John Chiang. He says Chiang opposes term limits and wants to undo Prop 13. Conlon says he needs 4.5 million votes to win in 2014. He notes 4 million Republicans voted in 2012. Second Vice Chair Mary Young uses her report to thank every volunteer. Treasurer Mark Bucher says the bills are paid. Assistant Treasurer TJ Fuentes says all dues are paid, except for some of the ex officio members (ex officio members are members of Congress, Board of Equalization members, state legislators, and Republican nominees for those offices). Parliamentarian Kermit Marsh notes the Ethics Committee has not yet needed to meet because no one has filed an ethics complaint. Meeting adjourns at 8:18 PM. The mailer was large, in full color, and on good paper stock, so I wondered how Citizens was paying for this apparently city-wide mailer. My search at the Secretary of State and County websites came up empty, but I hit pay dirt at the City of Mission Viejo’s website (some are questioning whether Citizens was required to file with the County given that they are supporting a county-wide candidate). On September 30, 2014, Citizens received a $5,000 donation from the Orange County Employees Association, and on October 10, 2014, it received a $13,000 donation from the Orange County Professional Firefighters Association, both public employee unions. When I see public employee unions getting involved with Republican candidates, I get curious as to how the candidates feel about union money being spent on their behalf, particularly such a large donation from two well-known public employee unions. Union money contributed directly to Republican candidates is a red flag for most conservatives (and would violate the candidate’s GOP pledge to not take union money if they signed it), so unions backing a Republican typically will make a contribution to a PAC that will then send a mail piece out as an independent expenditure. Often candidates claim they have no control of independent expenditures so they can disclaim any responsibility yet still reap the benefits of the mailer. So, I reached out to Leckness, Reardon, Bucknum, and Bartlett for comment. To their credit, I received responses from Reardon (who signed the pledge) and Bucknum, both of whom stated that they did not know about the mailer until they received it on Wednesday, and both also stated that they have not been offered or taken any union money. After giving the candidates 24 hours to respond, I have not heard back from Leckness or Bartlett. While I recognize that all candidates and their supporters embellish their mailers, outright lies should not be tolerated. Curiously, the PAC’s mailer repeats the same lie that Bartlett previously made against Ming falsely stating that Ming approved a loan to the City Manager at below market rates, when in fact Ming only voted for the loan on the condition that it be at prevailing market rates. (here) Unfortunately, I did not hear back from Bartlett to address whether her campaign provided any information, including the false interest rate, to the PAC for the mailer. The PAC mailer also suffers from a lie by omission. While touting Bartlett as a fiscal conservative by noting her efforts to balance the budget and reduce pensions, the mailer conveniently ignores the fact that Ming, too, helped balance Laguna Niguel’s budget ever year that he has been on the Council. Union money has become all to prevalent in national, state, and local politics. The unions extort dues from their members and use that never-ending supply to support candidates who they believe will further their cause. I know Reardon and Bucknum personally, and I take them at their word that they did not know anything about the union-backed mailer supporting them. I also know that Bartlett has been willing to use false facts in an effort to smear Ming, and has not retracted any of those false press releases, even when faced with undeniable evidence of the false facts. Bartlett also failed to respond to my questions about the PAC mailer that uses the same false information she previously used. I leave it to the voters to decide who to trust in November. “Shawn Steel (former chairman of the state Republican party, current National Republican Committeeman, and husband of Michelle Steel), recently wrote a commentary about the California Republican party titled: Not your granddaddy’s California GOP. In it he decried that we have “watched our voter registration numbers dwindle with the state’s changing demographics,” implying that it is because of the demographic shift that we have declining numbers. That may be part of the problem but it is certainly not the majority of the problem. I hear from people of all backgrounds regarding various issues in our county that they want leadership based on the issues, not on race or how someone looks. This type of rhetoric does not encourage people to become Republicans. It is not because of how we look that people chose a different party. Those words have absolutely nothing to do with the issues we face in Orange County or our country and we don’t need our county to be associated with that. Including more people from a variety of backgrounds and heritage is certainly a good thing. Both of my parents immigrated to this country and my wife’s mother immigrated here from Viet Nam. But should we be supporting people just because of how they look or should we look at their position on the issues? People have asked me why I am running for Orange County Supervisor. I tell them because we need someone who is from Orange County, knows Orange County, and will represent them on the issues that are important to them. It is well known in Republican circles that my opponent moved here from Los Angeles to run for this so she can spring board to a congressional seat with Rohrabacher’s backing when he steps down. In short, all the wrong reasons to run. I have the endorsement of Republicans like John Moorlach and Democrats like Councilwoman Diana Carey because I have stood strong with them on the toll lane issue and I recently had a rehab home reform bill pass with bipartisan support. I co-authored a bill with Senator Mark Leno, D-San Francisco to allow hemp production in California. The Steel’s, who still have their home in Rancho Palos Verdes, were strong backers of convicted and disgraced Sheriff Carona even when he was running for re-election. With the Steels so involved in behind the scenes Republican politics, it definitely has an influence in our county. I stood up in front of the Republican Central Committee while Carona was in the audience and voiced support for his opponent. I am not afraid to stand up to corruption or establishment politicians and I keep an open door policy with everyone I represent. Michelle is being heavily backed by corporate interests who are in strong support of toll lanes on the 405. While she has expressed token passive opposition to the toll lanes for political cover, I have been outspoken in the effort to keep OCTA board members from caving in to Caltrans desire to use our Measure M funds to put in toll lanes. The state cannot put in toll lanes without our cooperation and funding. This is an on-going battle that we can win but it requires taking a stand for accountability to the taxpayer. I am doing that. Don’t count on that from the Steels. It is issues like these and many others that we should be talking about, not calling people names. If the highly charged partisan rhetoric mentioned above coming from the Republican establishment replaces discussion of the issues, then Orange County will be headed in the wrong direction for the next eight years. We need results based leadership, not political based. Though Mansoor has a seriously uphill battle to win in this race, I do wish him victory.